Rick and Gary Guanella started working on automobiles in their barn in 1975 on Burbank Avenue in Santa Rosa. Rick, a former Golden Gloves boxer, took down the boxing ring and replaced it with a lift and auto repair equipment. The brothers’ first business was re-building and re-selling totaled vehicles. Word spread about the quality of their work and Guanella Auto Body was formed, as they opened their first facility a few blocks away on Sebastopol Road. Rick and his wife, Abbe, took over the business and in time, all of their three children worked at the shop. Over the years, there were always more cars than repair bays, so Guanella Auto Body expanded into one of the most impressive facilities in the entire Bay Area. 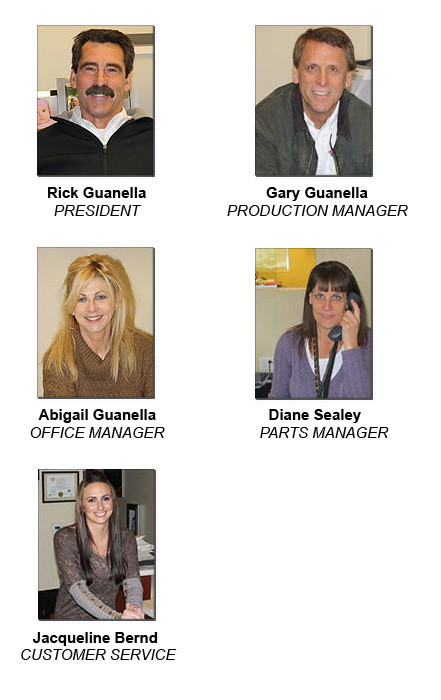 After investing in latest technology and environmental controls, Guanella Auto Body opened at its present location at 2789 Sebastopol Road in March 2008. Today, Guanella is even more of a family business. Gary has returned to help run the vehicle repairs, and Diane, their sister, works in the front office. Jacqueline, Rick and Abbe’s youngest, is also working with customers at the front desk. Using all his experience, their son Ray owns and operates Outlaw Customs & Classics, which builds, restores, and customizes cars and trucks. And their daughter, Melissa is a teacher in the Santa Rosa Unified School District. As a family owned business with long roots in Sonoma County, Guanella is all about trust and customer satisfaction. Their state-of-the-art facility, beautiful lobby, and great staff will make you feel comfortable and at home.